Smt. 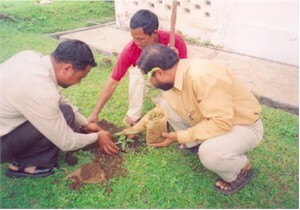 S.N.Sangma, Sr.Grade Lecturer and Smt. P. Das, Sr. Grade Lecturer attended a 21 Day Refresher Course for Meghalaya Teacher Educators on “Transforming Teacher Education for Quality Teachers” organized w.e.f. 9th -28th January 2017, by the Directorate of Educational Research and Training (DERT) Shillong in Collaboration with Azim premji University Bangalore at DERT Shillong. Smt. D.R.Marak, Sr.Grade Lecturer, Shri. M.Haque, Sr.Lecturer and J.M.R.Marak, Lecturer attended Programme on “Monitoring and Tracking of Programme Implementation” held w.e.f 26th – 27th April 2017 organised by RMSA, Directorate of School Education and Literacy (DSEL), Shillong. Smt. Y.R.Marak, Principal i/c and Selection Grade Lecturer, Shri. C.R.Marak, Sr.Grade Lecturer, Smt. S.N.Sangma, Sr.Grade Lecturer, Smt. D.R.Marak, Sr.Grade Lecturer,Smt. P.Das, Sr.Grade Lecturer, Smt.T.Ch.Momin, Sr.Grade Lecturer,Shri.J.M.R.Marak, Lecturer and Smt. L.K.Sangma, Lecturer attended “Orientation Programme of the DIET faculty on the Revised D.El.Ed Curriculum” held w.e.f. 8th -12th May 2017 organised by the DERT in collaboration with the Central Institute of Education, (RRCEE) University of Delhi at Delhi University. Ms. N.L.R.Marak, Lecturer and Ms. Iamynjurlang I.KA. Nongkling, Lecturer, attended Induction Training Programme organized by DERT in collaboration with Azim Premji University, Bangalore on Teachers Professional Development held w.e.f. 3rd -8th July, 2017 at DERT Shillong.